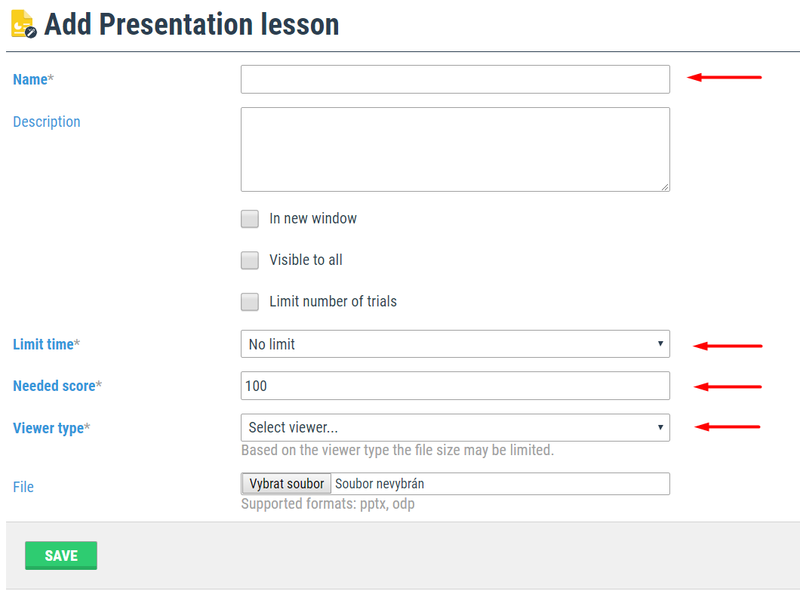 Presentation Lesson is one of the easiest way to upload your content in Training-Online.eu as all your learning content you have created so far may be used as learning and preparation lessons. The advantage of Presentation lesson is the native presentation behavior such as animations or embedded videos. 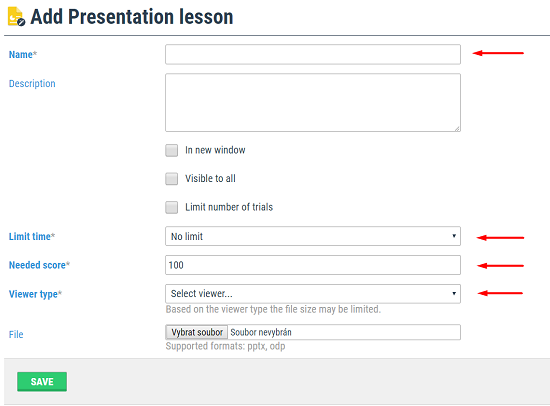 MS PowerPoint PPTX and OpenOffice ODP presentations formats may be uploaded. We believe this will increase your users experience. * Visible to all - the lesson will be visible to all your system administrators and they may use it for their students as well. * Limit number of trials - set the number of trials. This number then checks number of opens the document and if reached it will lock the lesson. You may set 0 for unlimited attempts. - Videos & Animations (max 10MB) - the files including the native presentation animations and videos are limited to the size of 10MB due to the online browser limitations. We use the Microsoft Office PowerPoint online browser where you always get an access to the latest PowerPoint functionality. If your file doesn't fit into 10MB size try to optimize the size of the presentation by compressing pictures and other components. This very often helps to overcome, bear in mind that those presentations aren't projected on the wall in the meeting room but the user will see that on his monitor or mobile device, therefore the pictures quality may be lover. - Static (No limit) - all presentations where you require no dynamic behavior may be uploaded with this selection. We offer different viewer here and therefore there is no restrictions on the file size. * File - select the pptx or odp file. Please pay attention to File sizes available for uploads. In case the uploaded file is larger than the values, the system will prevent uploading. You need to resolve in Settings / Space Management. You may replace the file in the future anytime. Edited 5 time(s). Last edit at 09/23/2018 12:40PM by Masteradmin.